This gene encodes a member of the HIN-200 (hematopoietic interferon-inducible nuclear antigens with 200 amino acid repeats) family of cytokines. The encoded protein contains domains involved in DNA binding, transcriptional regulation, and protein-protein interactions. The protein localizes to the nucleoplasm and nucleoli, and interacts with p53, retinoblastoma-1 and BRCA1. It modulates p53 function, and inhibits cell growth in the Ras/Raf signaling pathway. IFI16 has been shown to play a role in the sensing of intracellular DNA - a hallmark of virally infected cells - and has also been linked to the death of HIV-infected helper CD4 T cells by proptosis, a highly inflammatory form of programmed cell death. ↑ "Diseases that are genetically associated with IFI16 view/edit references on wikidata". ↑ Trapani JA, Browne KA, Dawson MJ, Ramsay RG, Eddy RL, Show TB, White PC, Dupont B (Oct 1992). "A novel gene constitutively expressed in human lymphoid cells is inducible with interferon-gamma in myeloid cells". Immunogenetics. 36 (6): 369–76. doi:10.1007/bf00218044. PMID 1526658. ↑ Trapani JA, Dawson M, Apostolidis VA, Browne KA (Dec 1994). "Genomic organization of IFI16, an interferon-inducible gene whose expression is associated with human myeloid cell differentiation: correlation of predicted protein domains with exon organization". Immunogenetics. 40 (6): 415–24. doi:10.1007/bf00177824. PMID 7959953. 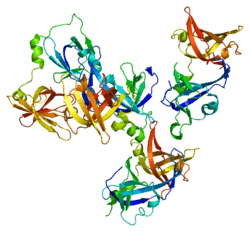 1 2 "Entrez Gene: IFI16 interferon, gamma-inducible protein 16". ↑ Liao, Jack C. C.; Lam, Robert; Brazda, Vaclav; Duan, Shili; Ravichandran, Mani; Ma, Justin; Xiao, Ting; Tempel, Wolfram; Zuo, Xiaobing (2011-03-09). "Interferon-inducible protein 16: insight into the interaction with tumor suppressor p53". Structure (London, England: 1993). 19 (3): 418–429. doi:10.1016/j.str.2010.12.015. ISSN 1878-4186. PMID 21397192. ↑ Ouchi, Mutsuko; Ouchi, Toru (2008-01-01). "Role of IFI16 in DNA damage and checkpoint". Frontiers in Bioscience: A Journal and Virtual Library. 13: 236–239. ISSN 1093-9946. PMID 17981541. ↑ Dutta, Dipanjan; Dutta, Sujoy; Veettil, Mohanan Valiya; Roy, Arunava; Ansari, Mairaj Ahmed; Iqbal, Jawed; Chikoti, Leela; Kumar, Binod; Johnson, Karen E. (2015-06-01). "BRCA1 Regulates IFI16 Mediated Nuclear Innate Sensing of Herpes Viral DNA and Subsequent Induction of the Innate Inflammasome and Interferon-β Responses". PLoS pathogens. 11 (6): e1005030. doi:10.1371/journal.ppat.1005030. ISSN 1553-7374. PMID 26121674. ↑ Unterholzner L, Keating SE, Baran M, Horan KA, Jensen SB, Sharma S, Sirois CM, Jin T, Latz E, Xiao TS, Fitzgerald KA, Paludan SR, Bowie AG (2010). "IFI16 is an innate immune sensor for intracellular DNA". Nat. Immunol. 11 (11): 997–1004. doi:10.1038/ni.1932. PMC 3142795 . PMID 20890285. ↑ Monroe KM, Yang Z, Johnson JR, Geng X, Doitsh G, Krogan NJ, Greene WC (2014). "IFI16 DNA sensor is required for death of lymphoid CD4 T cells abortively infected with HIV". Science. 343 (6169): 428–32. doi:10.1126/science.1243640. PMC 3976200 . PMID 24356113. ↑ Doitsh G, Galloway NL, Geng X, Yang Z, Monroe KM, Zepeda O, Hunt PW, Hatano H, Sowinski S, Muñoz-Arias I, Greene WC (2014). "Cell death by pyroptosis drives CD4 T-cell depletion in HIV-1 infection". Nature. 505 (7484): 509–14. doi:10.1038/nature12940. PMC 4047036 . PMID 24356306. Dawson MJ, Trapani JA (1995). "IFI 16 gene encodes a nuclear protein whose expression is induced by interferons in human myeloid leukaemia cell lines.". J. Cell. Biochem. 57 (1): 39–51. doi:10.1002/jcb.240570106. PMID 7536752. Dawson MJ, Trapani JA, Briggs RC, et al. (1995). "The closely linked genes encoding the myeloid nuclear differentiation antigen (MNDA) and IFI16 exhibit contrasting haemopoietic expression.". Immunogenetics. 41 (1): 40–3. doi:10.1007/BF00188431. PMID 7806273. Johnstone RW, Kerry JA, Trapani JA (1998). "The human interferon-inducible protein, IFI 16, is a repressor of transcription.". J. Biol. Chem. 273 (27): 17172–7. doi:10.1074/jbc.273.27.17172. PMID 9642285. Johnstone RW, Kershaw MH, Trapani JA (1998). "Isotypic variants of the interferon-inducible transcriptional repressor IFI 16 arise through differential mRNA splicing.". Biochemistry. 37 (34): 11924–31. doi:10.1021/bi981069a. PMID 9718316. Dawson MJ, Elwood NJ, Johnstone RW, Trapani JA (1998). "The IFN-inducible nucleoprotein IFI 16 is expressed in cells of the monocyte lineage, but is rapidly and markedly down-regulated in other myeloid precursor populations.". J. Leukoc. Biol. 64 (4): 546–54. PMID 9766636. Briggs LJ, Johnstone RW, Elliot RM, et al. (2001). "Novel properties of the protein kinase CK2-site-regulated nuclear- localization sequence of the interferon-induced nuclear factor IFI 16.". Biochem. J. 353 (Pt 1): 69–77. doi:10.1042/0264-6021:3530069. PMC 1221544 . PMID 11115400. Johnstone RW, Wei W, Greenway A, Trapani JA (2001). "Functional interaction between p53 and the interferon-inducible nucleoprotein IFI 16.". Oncogene. 19 (52): 6033–42. doi:10.1038/sj.onc.1204005. PMID 11146555. Gariglio M, Azzimonti B, Pagano M, et al. (2003). "Immunohistochemical expression analysis of the human interferon-inducible gene IFI16, a member of the HIN200 family, not restricted to hematopoietic cells.". J. Interferon Cytokine Res. 22 (7): 815–21. doi:10.1089/107999002320271413. PMID 12184920. Izmailova E, Bertley FM, Huang Q, et al. (2003). "HIV-1 Tat reprograms immature dendritic cells to express chemoattractants for activated T cells and macrophages.". Nat. Med. 9 (2): 191–7. doi:10.1038/nm822. PMID 12539042. Clarke CJ, Apostolidis V, Hii LL, et al. (2003). "Critical role of the transcription factor AP-1 for the constitutive and interferon-induced expression of IFI 16.". J. Cell. Biochem. 89 (1): 80–93. doi:10.1002/jcb.10475. PMID 12682910. Xin H, Curry J, Johnstone RW, et al. (2003). "Role of IFI 16, a member of the interferon-inducible p200-protein family, in prostate epithelial cellular senescence.". Oncogene. 22 (31): 4831–40. doi:10.1038/sj.onc.1206754. PMID 12894224. Kwak JC, Ongusaha PP, Ouchi T, Lee SW (2003). "IFI16 as a negative regulator in the regulation of p53 and p21(Waf1).". J. Biol. Chem. 278 (42): 40899–904. doi:10.1074/jbc.M308012200. PMID 12925527. Aglipay JA, Lee SW, Okada S, et al. (2004). "A member of the Pyrin family, IFI16, is a novel BRCA1-associated protein involved in the p53-mediated apoptosis pathway.". Oncogene. 22 (55): 8931–8. doi:10.1038/sj.onc.1207057. PMID 14654789. Raffaella R, Gioia D, De Andrea M, et al. (2004). "The interferon-inducible IFI16 gene inhibits tube morphogenesis and proliferation of primary, but not HPV16 E6/E7-immortalized human endothelial cells.". Exp. Cell Res. 293 (2): 331–45. doi:10.1016/j.yexcr.2003.10.014. PMID 14729471. Fujiuchi N, Aglipay JA, Ohtsuka T, et al. (2004). "Requirement of IFI16 for the maximal activation of p53 induced by ionizing radiation.". J. Biol. Chem. 279 (19): 20339–44. doi:10.1074/jbc.M400344200. PMID 14990579.